It was with some trepidation that she realized the online calendar showed the next Saturday to be free. Free from drop-offs, pick-ups, games to attend, events to plan. The day was fully available – for whatever challenge she wished to take on. She had considered delegating. Over the years, she had even suggested that the task could be linked to some remuneration; a strategy that could sometimes generate enthusiasm from their teenagers. Fat chance. Just getting them to empty the kitchen container was an achievement in itself. After a series of complex negotiations, the teenaged victim would wince dramatically as he held the container (full of half-eaten vegetables, covered in a soft blue moss and sitting in a foul-smelling slime) as far away from his body as possible. It would be rushed outside and tipped quickly in order to avoid triggering the gag reflex. Never mind that the vegetables were in the container mainly because the eldest couldn’t stand the jelly-textured goo of the inside of tomatoes and the youngest balked as the way her pee smelled of rubber every time the menu contained asparagus. There was no convincing them to step up and take on the yearly task of harvesting the compost. Her husband, less overt in his discomfort with rotting food, simply managed to never get around to it. So waking up on that sunny Saturday morning, the lurking feeling of obligation had converted to a real sense of urgency. The compost needed to be turned or the leaves would never break down. She needed to extract the rich brown matter that would serve as fertilizer or the garden would suffer. If it wasn’t tackled today, it was never getting done. They would end up with an overflowing bin, a pest-control problem, a composter encased in weeds. In short, havoc would reign. The spade cut through the pile that was left exposed after she had lifted off the black container. First, she peeled off a layer of surprisingly fresh-looking vegetable pieces on top followed by chunks of fibrous strands, woven together like a mat, with black mud forming the glue. Then, there was a wet, sucking sound as she separated off decomposing chunks of organic matter, releasing an astringent, earthy, orange smell. She had been working for less than an hour and was embarrassed to already feel tired. Some people made a living working like this, putting in full eight-hour days; but over the past few years, nature had made a point of reminding her of her mortality. A pinched nerve in her lower back aching for the past four years, shoulder pain remaining from a cross-country skiing fall in January, general stiffness that had worsened since her regular yoga sessions had fallen by the wayside. Once, (was it 20 years ago?) she remembered thinking briefly that she would probably be lucky and age slowly. She would surely keep a youthful attitude, and with regular exercise she would bypass that phase of life in which men and women group together to complain about their aches and pains. Now in her 50th year, it felt like she was being chided for her vanity. Apparently, she would not be escaping the inevitable. 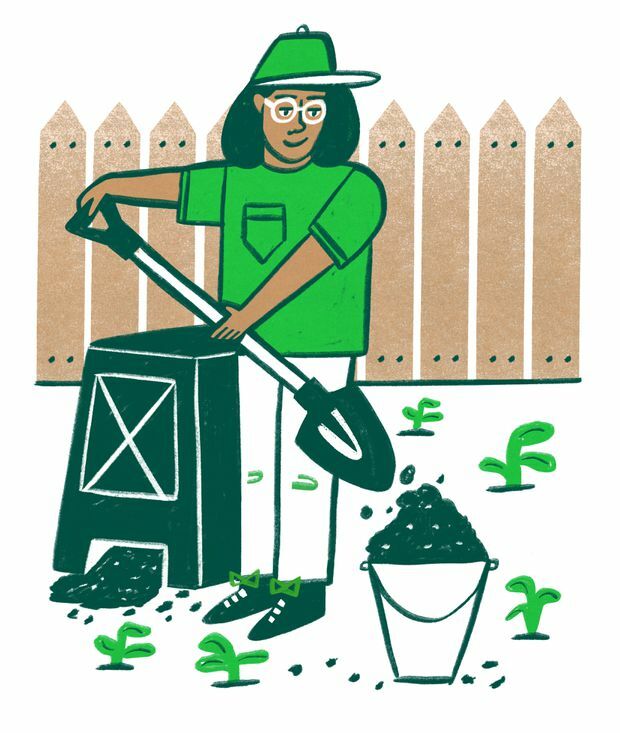 Having got down to the layer of usable compost, she was able to kneel in the grass and sort through the earthy matter with her gloved hands. Avocado pits could be split to reveal brown clay-like insides, the insides of mango stones were still gooey and both were tossed back into the compost bin for next year’s haul. Nothing could be done with peach pits, egg shells, clumps of roots and sticks, which were chucked into the garden-waste bin. From time to time, she came across the skin of a cherry tomato, crinkly and red like a piece of torn Christmas tissue paper. Once she found a whole, practically unused tea-light candle, still in its metal casing. It was a mystery until a few inches deeper she located the twisted, fibrous shape of a pumpkin stalk. Into the garbage went elastics, fruit stickers, the mesh from those fancy fabric tea bags she had received as a Christmas gift two years ago and even more fruit stickers. The result was four buckets of dark brown compost, still mixed with bits which probably should have been extracted (squash seeds, small clumps of fine roots, stick pieces, those darned fruit stickers!) but her patience and energy had about run out. Really, her time could have been better put to use – perhaps having her hair done to hide the incoming grey, shopping for new clothes to counter what she feared was a matronly trend appearing in her wardrobe – or maybe a facial? Four hours, four buckets. Deep down, however, she knew why she had kept up this ritual for the past 10 years. It assuaged the dismay she felt the moment she found a bunch of forgotten kale, tough and yellow in the bottom of the chill tray. There was the small satisfaction of being able to clear off a counter full of unusable leek leaves or corn husks into the kitchen compost container instead of the garbage. But mostly, there was the feeling that nature was working by her side. In the morning, she would take last night’s vegetable cast-offs to the composter and while she was in budget meetings, performance reviews and planning sessions, that black bin was hard at work, breaking down last night’s supper residue. At night, while she was sleeping the insects were digesting. And eventually, she would get around to extracting the result of years of slow transformation. She would delight in the thought of the goodness being fed to this year’s garden. Despite the rogue tomato and squash plants growing in the flower beds, she would be amazed. Amazed at the process, amazed that it worked and in the end, just happy to be a part of it. Siân Morgan lives in Beaconsfield, Que.